When asked what they want to be when they grow up, a lot of children would say they want to become a doctor so they can cure the sick. What these kids don’t realise just yet is that a doctor does a lot more than just stitching wounds and thrusting syringes. On top of his medical duties, a doctor is a businessman, too; and like any other businessman, he has a great deal of financial concerns to handle. With the changing health care system in Australia, many doctors in Melbourne may just be nearing their tipping point, with their hands full from handling patients and enormous amounts of paperwork at the same time. Sooner or later, one of these just might suffer in quality, and any responsible doctor will certainly make sure it is not that of health care they provide. The most likely prey would then be the doctor’s finances. Failure to observe the right accounting and record keeping practices just might result in financial problems, which could eventually lead to the practice’s demise. An article by Demand Media contributor Jack Powell on Chrome.com discusses the accounting documents that doctors need to always keep current. Large public hospitals are typically highly-organised institutions, staffed by different professionals who perform specific functions. In contrast, small to average-sized private practices are run by fewer people, sometimes no more than the doctor himself, and perhaps a nurse or an assistant. 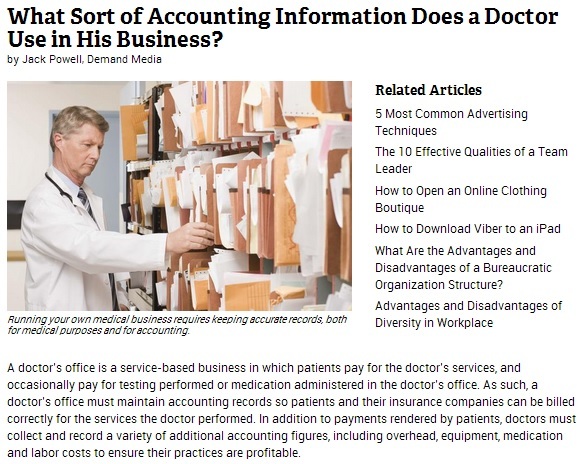 It is not often that the doctor is an accounting expert himself– something which has led to accounting woes among many practices. To address this situation, the services of accountants for doctors in Melbourne are needed. Fortunately, there are companies like MEDIQ Financial that provide accounting services for medical practices. The pros in these services can perform various related jobs, such as taxation and bookkeeping. They can even design financial strategies that can streamline the transactions in a medical office. With the help of a skilled accountant for doctors, physicians can go about their roles of keeping others healthy without having to worry about the state of their books.